When you go to Checkout your order, you will have 2 options presented to you for shipping your order - Standard or Express. The cost of Standard shipping will be between $7 and $29, and the cost for Express shipping will be between $19 and $59. The difference in cost is simply related to the weight of the package - the lighter packages will be closer to the smaller cost and the heavier packages will be closer to the higher cost estimate. At the time that you go through our Checkout pages, you will clearly see what the cost of the shipping will be for your order, depending on whether you select the Standard shipping or the Express shipping. In fact, at the time that you are asked to make the choice between Standard and Express, you will see the actual cost of those shipping options shown to you, to help you decide which option is best for you. For shipping outside the United States, we offer USPS International Priority shipping and USPS Express Mail shipping. The USPS International Priority shipping promises delivery in 6 to 10 days AFTER we ship your order. The USPS International Express shipping promises delivery in about 5 days AFTER we ship your order. However, please note that we do not ship to all countries outside the United States. Currently, we will ship to the following countries: Canada, Mexico, all Central American and South American countries, all European countries, all Middle Eastern nations, Japan, China, Korea, Australia, New Zealand, and India. If your country is not listed here, please contact us for consideration in having us ship to your country. In general, all of our products are shipped out within 1 to 3 business days after you place your order with us. If you choose Standard shipping, you can figure it takes from 2 to 6 business days AFTER your order ships - so Standard shipping will generally get your order delivered to you in about 4 to 8 days AFTER you place your order. However, please note that most of our manufacturers are in the East Coast area (our manufacturers ship out our orders for us directly to you), so the closer you are to the East Coast, the shorter the Standard shipping time. 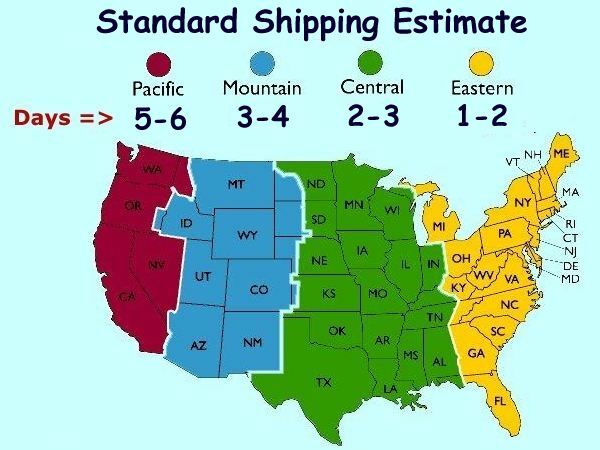 In general, the shipping time on the East Coast is just 1 to 2 days, the Midwest is 2 to 3 days, and the West Coast is 4 to 6 days. If you choose Express shipping, you can figure it takes from 2 to 3 business days AFTER your order ships - so Express shipping will generally get your order delivered to you in about 2 to 5 days AFTER you place your order. Please remember that delivery estimates do NOT include Sundays or holidays - but since we use either UPS, FedEx, or the Post Office, deliveries are possible on Saturdays for FedEx and the Post Office.